This time of year is traditionally when people in Australia go a little crazy for balls of all kinds. August sees the start of the football season, with the local A-League (this year bolstered by a second Melbourne team in Melbourne Heart) and the start of the European football season - including the English Premier League and Champion's League. The first mentions of summer cricket start to be made whilst at the the oval end of the ball spectrum September is finals month for the Australian Football League (AFL) and National Rugby League (NRL). 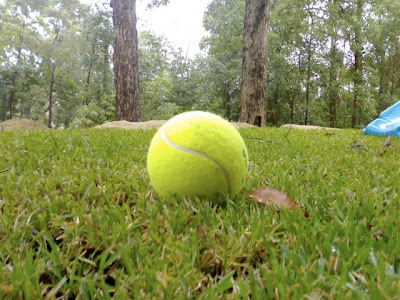 So, in the spirit of this ball-fest I'd like to bring you up to date with our sister site, i am Ball, dedicated to the adventures of a plucky young tennis ball called Ball. I wrote about Ball on these pages back in May when he was just setting off on his adventures. Since then there have been over 25 reported sightings of our fuzzy friend from places as far apart as Cairns and Cornwall. Each spotting has been recorded with a photo and some detail of Ball's condition and general demeanour. It's not always good (dogs seem to have a love-hate-love relationship with him, and the less said about people mounting Ball on their car bumpers the better) but it's not all bad either and is all part of the adventure of being Ball. If you've never been please have a look and see what he's all about. This is a good place to start as you get an idea of who Ball is and what to do if you cross his path. Otherwise just have wander around i am Ball (http://whereisball.blogspot.com/) to read about his globe trotting adventures. Remember, if you see Ball say hello and take his picture. We're always hoping for more sightings from around the world, so please help do your bit to keep the word about Ball rolling.